ELKTON, Maryland, May 15, 2018 /PRNewswire/ -- W. L. Gore & Associates, Inc. (Gore) has been chosen as the key supplier of proton exchange membrane for the Sunrise Power HYMOD®-300 vehicle fuel cell stack. A leading Chinese supplier of vehicle fuel cell stacks and systems, Sunrise Power incorporated GORE-SELECT® Membranes in their latest system to meet their stringent requirements for durability and reliability — key factors for the commercialization of fuel cell vehicles. 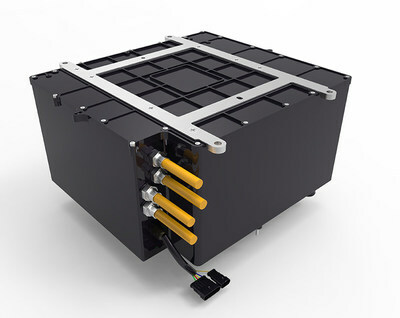 Gore's GORE-SELECT® Membranes, which facilitate a fuel cell's electrochemical reaction between hydrogen fuel and oxygen, supported the Sunrise Power fuel cell stack's ability to exceed 5000 hours of operation testing, while also achieving low-temperature start-up at -10 °C and storage at -40 °C. "GORE-SELECT® Membranes' superior durability provided us with the reliable technology to break through the 5000 hours barrier," says Dr. Hou Zhongjun, CTO and Vice General Manager from Sunrise Power, "This was a key performance milestone in developing the HYMOD®-300 stack for use in demanding vehicle applications." Gore uses a proprietary reinforced membrane technology based on ePTFE (expanded polytetrafluoroethylene). GORE-SELECT® Membranes are exceptionally thin, strong and power-dense, allowing them to support cost-effective fuel cell technology. For more than 20 years, Gore has been a leading supplier of MEAs (membrane electrode assemblies) and PEM fuel cell technology. Today, GORE-SELECT® Membranes are considered the industry standard for challenging automotive applications and have been proven in energy-efficient vehicles from leading OEMs as well as in thousands of transportation, portable, and stationary applications worldwide. SOURCE W.L. Gore & Associates, Inc.